Poor old cauliflower. A lot of people my age (and up) still think it’s totally boring, just another white food without a particularly distinctive flavor of its own. Maybe it’s because it used to get boiled to mush, or because most older recipe books offer ideas for cauliflower with cheese sauce, period. That’s about as racy as it got, back in the day. These days, however, cauliflower is as trendy as kale was a decade ago. This is fair enough, since cauliflower starts to shine the minute we kick it up a notch. I must admit that I’m not a fan of cauliflower pizza crust, and I don’t really love the cheese sauce thing either. However, whether roasted or steamed or riced or made into crispy cakes, cauliflower makes a simply sensational showcase for creatively zippy sauces. Besides, white cauliflower is getting gently nudged aside by its prettier cousins. These days, we can grow rosy purple or orange or soft golden or green cauliflowers that look great on the plate and provide a nutritional punch. These pretty colors aren’t due to GMO tinkering, but the result of some bright eyed farmers and researchers who noticed oddball colored heads amid a zillion of their plain Jane kin. Clever hybridizers have hand bred selected colorful forms from such chance variations. The result is cheery orange cauliflowers like Orange Burst, high in carotene and vitamin A, as well as gorgeous purples like Graffiti or lavenders like DePurple, both rich in anthocyanins, the antioxidants that make blueberries blue. There’s even a true green cauliflower, Vitaverde, with bright chartreuse-lime heads and a clean flavor that’s a great carrier for spunky sauces on raw veggie plates. That’s also a great way to use stick cauliflowers such as Fioretto, with tender, creamy curds balanced atop jade green stems. Heritage Italian romanesco cauliflower is sometimes considered to be broccoli, since these cole cousins are closely related; romanesco is actually a transitional form between these two vegetables. Vivid green romanesco has a mellower, less peppery flavor than white cauliflower and it’s lovely both raw and roasted or grilled in slender spears like asparagus. Personally, I prefer cauliflower either raw, lightly steamed, or roasted into caramelized sweetness; boiling for more than about three minutes is Just Wrong, in my book. Try dipping raw or lightly steamed florets with lemony, garlic-y hummus, a spicy white bean spread, or goat cheese mixed with minced chives or basil. Toss roasted cauliflower florets with curry powder, garam masala, chili powder, or a deep red mixture of mayo and hot smoked paprika. Yow! Drizzle steamed cauliflower with fresh lime juice, homemade garlic salt, and toasted (unsweetened) coconut flakes. Toss thinly sliced purple or golden cauliflower with avocado oil and a little sea salt and roast it to crisp, golden perfection. It’s one of my favorite suppers for one and any leftovers are great in an omelet the next morning. These crispy cakes, liberally splashed with a buttery lemon and caper sauce, are another favorite. Steam cauliflower until barely tender (3-5 minutes). Mash, cool, and stir in salt, eggs, and green onions. Form into 8 balls, roll in flour and pat into flat cakes about half an inch thick, set aside. Heat oil in a wide, shallow pan over medium high heat and cook cakes a few at a time until crisp and golden, turning once (4-6 minutes per side). Remove to a plate in a warm oven as the cakes are done and add butter to the pan. When melted and sizzling, add lemon juice and rind to taste, then capers and paprika (and more salt to taste if need be) and spoon over cakes. Serves 4. Light and airy, riced cauliflower is a magnificent replacement for pasta or real rice or even mashed potatoes. All kind of sauces sing on a bed of this fluffy stuff, including gravy. Steam cauliflower for 5-7 minutes then press through a ricer into a serving bowl. Gently stir in butter and salt, set aside and serve with Singing Spring Green Sauce (see below), or any pasta or curry sauce. In a food processor, grind herbs, green onions, pumpkin seeds or nuts, and garlic to a coarse paste. Slowly add the oil, with machine running, then add cheese or nutritional yeast and pulse a few times to blend. Season to taste with cider vinegar, salt and pepper. Stir in capers and serve at room temperature. Makes about 1 cup. Refrigerate leftovers for up to 3 days. This entry was posted in Early Crops, Health & Wellbeing, Nutrition, Recipes, Sustainable Gardening, Sustainable Living and tagged Colorful Cauliflowers, Golden Cauliflower Cakes, Riced Cauliflower, Romanesco Cauliflower, Singing Spring Green Sauce, Stick Cauliflower. Bookmark the permalink. Thank you for the cauliflower ideas. Sometimes we just need a little inspiration to get out of the veggie rut. 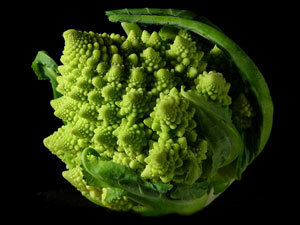 Romanesco is beautiful!